The Headless ds106 experiment we set up August-December 2013 had many successful points. Most was in the new influx of active participants, but the ending group project (not planned) was in terms of rich collaboration one of my peak ds106 experiences. But it was an experience that was still bound by time. It started and ended. And in discussion with Rochelle Lockridge about her wildly successful efforts in running a parallel ds106 experience inside the 3M corporate world, I felt more that the weekly pace was un-ncessary for a truly wide open ds106. It’s not completely filled out yet, but in a week, the Open ds106 Course ought to be fully built out. Rather than “weeks” they are units- the idea is that in re-use, they could be done in a time scale a user or group chooses (in the syllabus, I am adding suggested time spans based on the ds106 course at UMW). We are associating it any blog we had previously tagged as openonline — if your blog was part of Headless ds106, I might not have remembered to add both tags, so if yours is not listed on the Open ds106 Participant blogs, let me know so I can re-tag it. This probably will end up more of a reference for anyone that would like to repurpose ds106. I still think there is more power in people doing the same work in parallel, the network reinforcement effect. But there is no reason why a group could not decide to run their own timed series of ds106 for another class, professional development, or crazy people who just want to create together. All you would need to do is maybe set up a Google+ community, decide on a schedule, and go to it. Or people maybe will choose to move through the Open ds106 in their own pace. Now it’s true there is much more in each until than most people might choose to do. 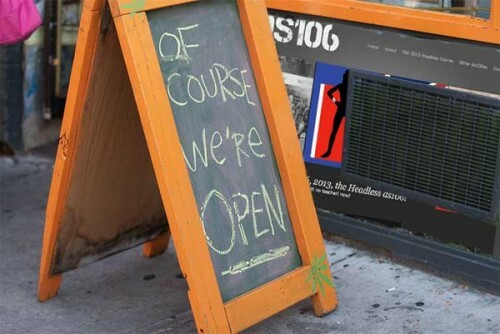 It’s more of a buffet than a prix fixe dinner. For Spring 2014 there is no UMW class to follow along with. I understand from Jim Groom that he will teach a summer 2014 version. And I have offered to teach on in Fall 2014 (unless that MacArthur check shows up) (heck if it did I would still teach) (but something could happen employment wise). I am teaching a different flavor of ds106 for an online 10 week graduate certificate course at George Mason University, this will start in mid March. As I am designing it now, it will be in the full open vein. As usual, we offer to set up a course aggregation for any teacher running a “ds106-ish” class- it need not be digital storytelling, but something that overlaps some with ds106. This could be anything from a Cyberspace History course (as previously taught by Scott Lockman), to a new one coming this spring– English Studies in the Digital Age, being taught by Jennifer Travis at St Johns University. 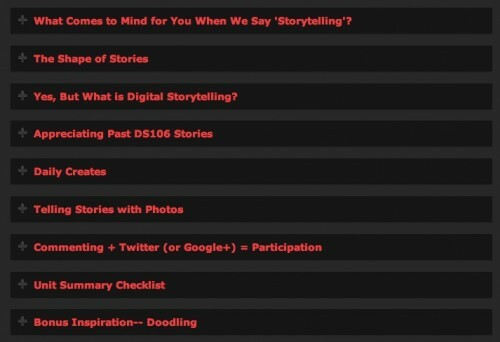 These would be courses where students will be individually blogging, and making use of the ds106 assignment bank and/or Daily Create, ds106 radio… What we do is add an option in the ds106 blog signup form so students can add their blog to the giant ds106 flow, but we can tag them internally to create a course flow. 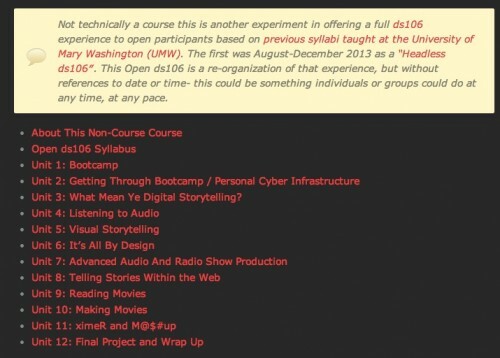 If this is of interest, see Are You Teaching a ds106ish Class? On each unit page, I am also making use of the nifty features built into the Salutation theme we use. One is static blocks, which are chunk of content you can sue elsewhere. Like the obscure concept of Wiki Transclusion, I can include this as a reference in my pages, and if the static block changes, those changes are propagated to all pages that use them. This has already paid off a few times as I had to tweak the text in the block. <h2>The ds106 Open Course</h2> <p>It's always on and never ends (<a href="http://ds106.us/open-course">learn more...</a>)</p> [siblings] If you have questions, corrections, suggestions, lavish praise, etc for this unit, please let us know via the comments form below. for this unit, please let us know via the comments form below. The editing is going much more quickly than assembling the Headless 13 lessons. I have a few links to update, and I remove all references to “week” and change them to unit. I am striving for a structure with an opening intro, some sort of “inspiration” media, and all the content. If you have comments, suggestions for topics or media, even corrections for typos, please add to the comments of each unit page. I am hopeful this can be a useful reference or jump off point, but mainly, shows that ds106 is of course open, but not quite a course, because a course of course always ends.